Let's ride the sky train into or out of Tibet! On July 1, 2006, China's President Hu Jintao was at newly renovated Golmud Train Station cutting the red ribbon for the launch of the first train to Lhasa and declared another magnificent feat made by the Chinese people after completion of the Three Gorge Dam. The first train coded as "Qing 1" gradually left the station at 11:05 am on Saturday and took its maiden trip across the Qinghai-Tibet Plateau. It finally arrived at Lhasa's brand-new Train Station at 00:31 on July 2, proclaiming the end of no train whistling on the roof of the world. The Qinghai-Tibet railway is totally 1,956 kilometers (1216 miles) long, consisting of 2 phases: the first phase 814 km (506 miles) from Xinning - the capital of Qinghai Province to Golmud opened in 1984; the second phase 1142 km (710 miles) from Golmud to Lhasa. In the following years, the Chinese government is going to extend the railroad to Shigatse (about 300 km west of Lhasa) and Linzhi regions (about 400 km east of Lhasa). The Qinghai-Tibet railway boasts 960 km track located 4,000 meters (12,000 feet) above sea level and the highest point at 5,072 meters (15,220 feet). The rail is dubbed "Sky Track" as many international experts hardly believe the people can build a railway in such a challenging area. The RMB33 billion (US$4.2 billion) project (second phase) was finished in four years from 2001 on Qinghai-Tibet Plateau with part of fragile permafrost and marsh easily damaged by human encroachment. Engineers used sunshades and high-tech cooling columns plunged into embankments to keep the ground stay frozen. 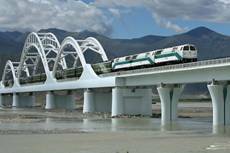 China has spent RMB1.54 billion ($190 million) for environmental protection along the railway. According to the China Xinhua news agency, the railway could double Tibet's tourist revenues by 2010 and cut transport cost into the region by 75 percent, lifting its 2.8 million people out of isolation. Tibet used to be a destination in China where people had difficulty traveling and exploring because of its high terrains. Now you can explore Tibet not only with rental cars and flights, but you can also take many different train trips to this Southwestern region in China. If you have never considered Tibet as a vacation destination you are missing out on one of the most exquisite and breathtaking places in the world. In the past, Tibet used to be a land of mystery and a lot of restrictions which prevented travelers from taking in the culture. Today, Tibet has become one of the most desired vacation destinations as more of this mysterious place is being discovered. The newest development within the Tibet tourism industry is the option to take a train through and to Tibet on the Qinghai-Tibet railway. Although taking the train to Tibet takes much longer than a plane flight, you can enjoy the amazing scenery and landscapes which Tibet has to offer. 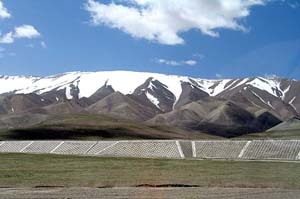 The Qinghai-Tibet railway is one of the highest railways in the world; the tracks are 4000 meters above sea level. For those from the rest of the world thinking of traveling to Tibet, this train tour is an option for you while visiting China. If you are planning a trip to Tibet and looking forward to some new adventures, this Tibet train tour is a great way to experience the scenery and landscapes. This professional train tour is based in the capital city of Tibet, Lhasa. While on your vacation you can take the train from Tibet right to other parts of China if you are interested in seeing more of the country within this area of the world. You will be amazed by the landscapes and sites you can see along the way without having to worry about driving yourself and remaining safe during your excursions. A great way to plan a successful train trip through Tibet is to schedule your plane flight to land in Lhasa and then from there take the train to your next destination. Although the capital city of Tibet has many of the metropolitan features you may be looking for, many tourists are finding more interest in the smaller and more scenic cities within Tibet. As Tibet is growing in the field of tourism you will find many great hotels, restaurants and entertainment venues. This Tibet train travel and adventure is a very affordable option for anyone looking to explore this mysterious and beautiful place with minimum stress. Although there still are some places this new railway system does not reach, it is a work in progress and one of the best transportation options Tibet has seen in a long time. Visit Tibet today and experience its beauty, mystery and culture first hand on this romantic train ride. Jennifer Aitken is a successful business writer living in Canada. She sometimes writes for the following blogs: Selling Timeshare, Wine Making Supplies, and China Lenox.